After leaving Orillia, we crossed the bottom end of Lake Couchiching and passed through “The Narrows” into Lake Simcoe. While only a moderately large lake, it does demand a boater’s respect as it has a reputation for whipping up extremely uncomfortable seas in a very short time. Wise boaters will always check the marine weather forecast before heading out onto this lake. For Sunday May 29th, we had a good forecast for the morning, with increasingly strong south-west winds in the afternoon. As hoped for and expected, we enjoyed a very smooth crossing, entering the start of The Trent Canal portion of the Trent Severn Waterway, just north of Beaverton, Ontario. Here you enter a series of canals and locks heading almost due east. This area of the system is all “man made” with Canal Lake and Mitchel Lake being flooded land where trees were taken down, but stumps were left. 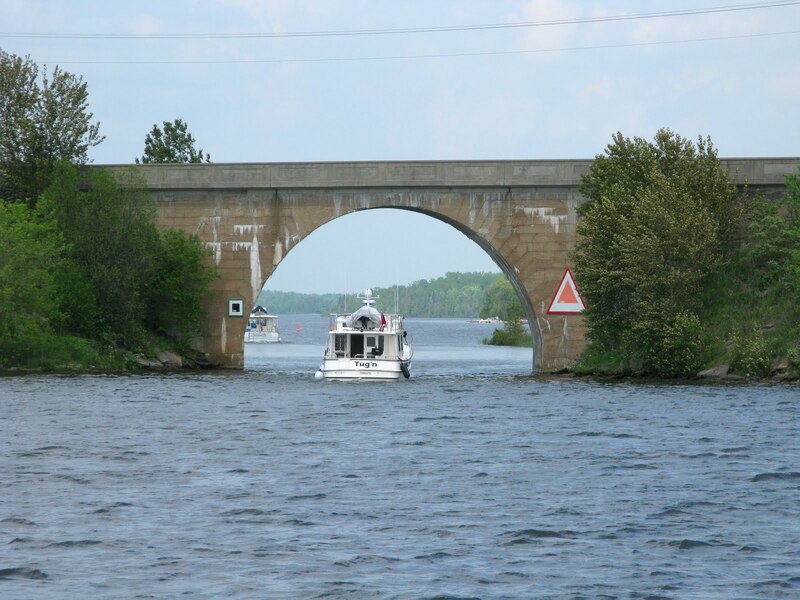 These stumps later became a concern to boaters and cottagers as they gradually broke free of the lake bottom and if disturbed by the turbulence of a fast boat, could float up dangerously close to the surface and damage propellers, shafts, boat bottoms and more. Cautious boaters will pass through these areas dead slow so as to not stir up dead heads (stumps) or worse, hit one of these. 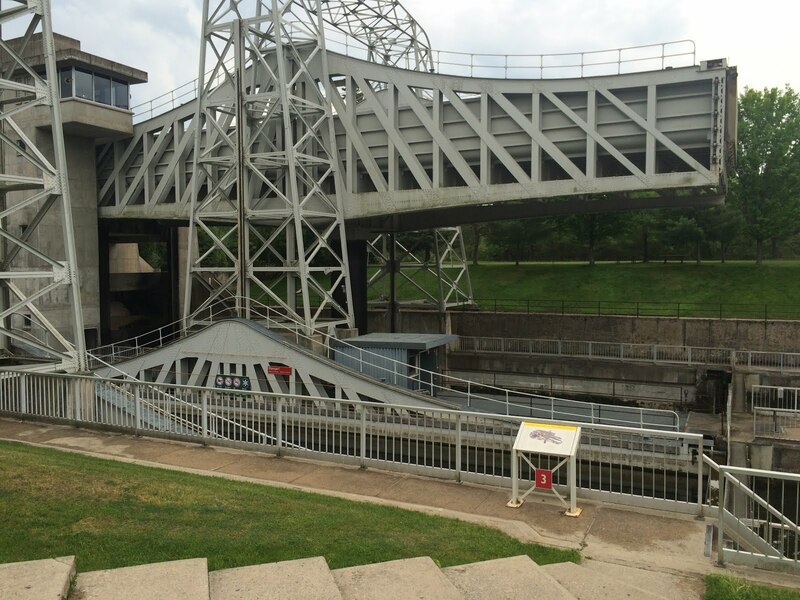 Federal Government cost control measures have resulted in lock staff covering multiple locks that are in close proximity. 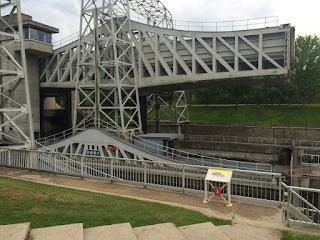 In the first stretch of the Trent, five lock staff were covering six locks. So, we’d end up seeing some of the same friendly faces at multiple locks. The staff also do their best to coordinate the locks, so when you leave one lock, the next one has it’s doors opened and ready for you when you arrive. This can greatly speed up ones transit through the system. Our last stop of the day was Kirkfield Lift Lock. This is a hydraulic boat lift consisting of two large tubs sitting on enormous pistons. One is in the upper position and the other in the lower. 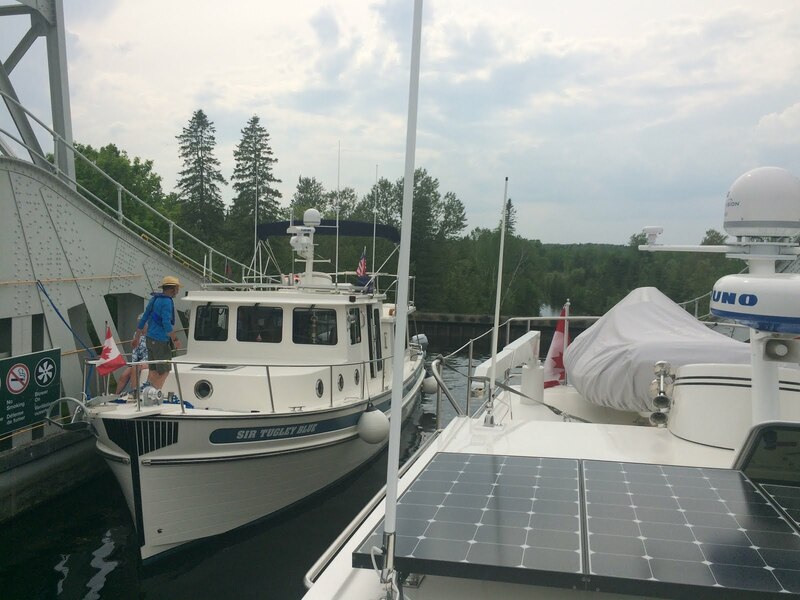 Gates are opened on each allowing boats to enter and tie up. 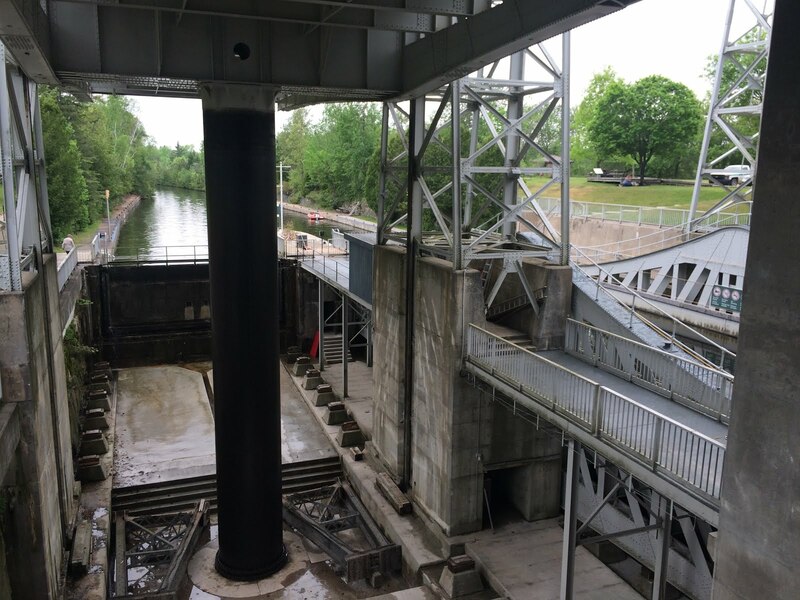 The gates are then closed and the upper tub / chamber will lower while the lower chamber will rise, brining those boats to the upper level. It is a wonderfully designed and engineered system that was adopted / adapted from old canals in Belgium to suit our colder climate. 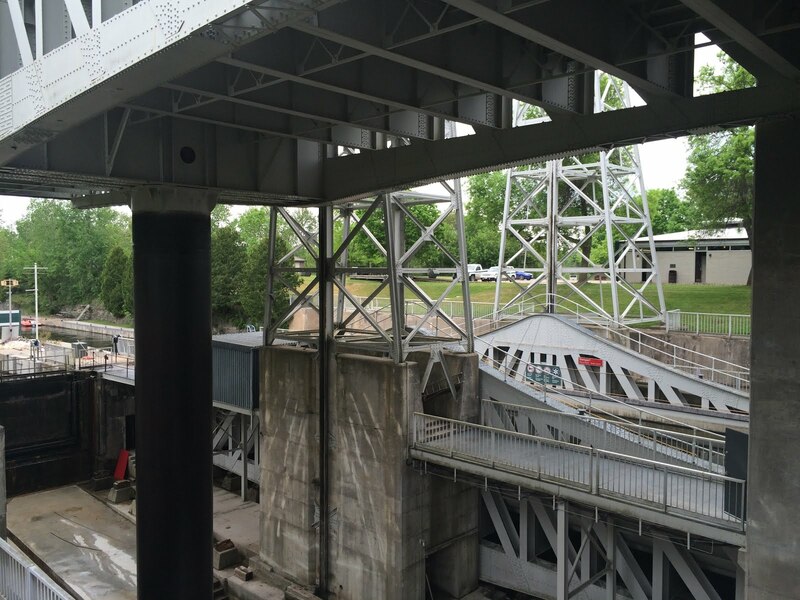 The Kirkfield lift lock was first opened in 1907 and subsequently renovated and automated in the 1960’s. As the photos show below, it is quite a marvellous site.